Every year in Tanzania, Newcastle disease threatens hundreds of thousands of poor rural families who depend on healthy flocks of chickens for food and income. Annual mortality rates from Newcastle reach 90%, because outbreaks wipe out households’ entire brood. A simple eye-drop vaccine exists however, and the cost for each chicken’s safety is equal to less than half a US penny. But challenges to widespread vaccination are great, especially in needing to significantly increase both public awareness and availability of the Newcastle vaccine. In 2010, Global Service Corps was awarded funding to start a Newcastle vaccination program for villages in Tanzania’s north-eastern Arusha Region. To date, GSC not only has vaccinated more than 500,000 chickens for families in the area but also ensures annual vaccination continues by having trained over 100 community vaccinators to carry on. Volunteers taking part in the program often call working alongside GSC staff in Maasai villages at sunrise, vaccinating chickens one household at a time, a highlight of their GSC experience. See them in action here. Please see more on program impact below. 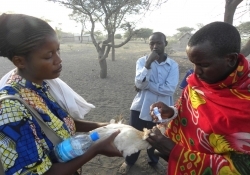 Global Service Corps’ chicken vaccination program in Tanzania’s Arusha Region has made a big difference in Naisula Estomiy’s life. A 34-year-old mother of two living in Olkereyan village, Naisula was selected for GSC’s training to become a community chicken vaccinator. She received knowledge and skills to schedule and carry out regular rounds of household visits, so that every 4-months she’s vaccinating at least 3,000 chickens. Before Naisula’s visits, Olkereyan villagers were unwilling to invest in raising chickens, since most died from Newcastle disease. They’d not feed the chickens, letting them fend for themselves. But now, chicken loss is minimal, families care for their chickens, and they see unprecedented yields. Naisula herself has increased her flock 700% and collects 25 eggs a day (pre-vaccination, a week could pass without a single egg). The small fee Naisula collects for her village rounds along with new chicken and egg sales equals food for her family and school fees for her children. Through Global Service Corps’ Newcastle vaccination program, Arusha Region villages have seen their chicken survival rate increase fivefold. Probable reduction of chickens lost to Newcastle has decreased to 20%, and the probable number of chickens saved from Newcastle death is 250,000. And! Village members trained by GSC to be community vaccinators are not only ensuring their service continues but making a small business out of it.